Here's a story from an Ohio High School where one in seven girls is pregnant. The school has preached abstinence-only. Like any other type of ban, it hasn't worked. Bans do not work. More likely, they have an opposite effect to the desired. What About The Three Blind Mice? The next episode of this drama will test the character and principles of Rodney Hide, Peter Dunne and Winston Peters. Labour want to pass legislation to validate everything they have done and bring in State funding of political parties. Act, NZ First and United Future all face hefty bills to repay the public money they spent on electioneering, and so far they look like they will support Labour's legislation. So, along with Helen Clark, they will all have their finger in the wind for the next few weeks testing public opinion to oblige Helen Clark and let her get away with it, or will they all have to pay the money back? You decide. OK. By my calculation, with the backing of NZ First and the Greens alone, UF and ACT can vote against any retrospective legislation and it will still pass. Having voted against it, will their principles demand they repay sums as have National and Maori? They will not be obliged to. And personally, as an ACT donor I wouldn't want my money being handed back to Parliamentary Services while Labour and the Greens sit on theirs. But, there is another way to look at this whole thing. If ACT spent my tax on their yellow bus I have no complaints. Just as Labour- supporting taxpayers probably won't be too concerned about public spending on the pledgecard and Green taxpayers won't be opposed to public spending on energy pamphlets, etc. And as the funding and spending is on a pro rata basis it all works out quite neatly. The only taxpayers who are really upset are National supporters and Libertarianz voters. If National had dipped into Parliamentary office funding too then their supporters would have also got some value for their tax dollars. Libertarianz, with no parliamentary representation, never got the option. * Bill English's campaign against the Government's foreshore legislation. * Green Party energy pamphlet. * NZ First's foreshore poster used last election. Here's the headline,"Britain: Labour government proposes punitive welfare reforms"
* Mandatory interviews every six months for lone parents on income support with children under 11 years of age and every three months for those whose youngest child is more than 11, in an effort to get them back to work. Oh, that's really harsh now. Of course, the reforms are all about "serving the needs of big business". It couldn't possibly be a matter of no longer tolerating some people living off the efforts and honesty of other people. Or that kids need an example of a working parent. Or that people are happier when they participate and have some control over their lives. No. The socialists, the great friends of the downtrodden, wouldn't see that. A report about how primary school children are performing is a mixed bag. It's not all bad but here's what stood out for me. It says, Girls and boys performed equally on most maths questions, and disparities between the performance of children in high and low-decile schools had reduced in the four years. Otago University's latest National Education Monitoring Project reveals a marked decline in pupils' knowledge of basic number facts and their ability to correctly answer simple maths problems, particularly at Year 4 (eight and nine-year-olds). Annis Hew, whose nine-year-old daughter, Tiffany Ang, receives extra maths tutoring in Christchurch once a week, said she wanted her daughter to excel beyond New Zealand's average standards. "We have come from Malaysia and we found the system here had a lower standard," Hew said. "She was above average when she got here, but we wanted her to be at the same standard as she would be in Malaysia, so we have sent her to tutoring to help with that." The lesson is don't just rely on the school to do the job. Make sure you know what your kids don't know. Outgoing Reserve Bank governor Ian Macfarlane has warned that Australia likely faces a recession within the next seven years — one that could be made far worse by the heavy debts of Australian households. Mr Macfarlane said that the biggest risk was that if an outside shock made the economy slow down or start to contract, the debt-heavy household sector, instead of continuing to spend and stabilising the economy as in the past, would cut its spending, making the downturn worse. In the 1990-91 recession, he said, "the boom and bust was in the corporate sector. Companies were going broke, banks failing, people selling stuff at distress prices. The household sector was a stabilising force. "What I fear is that next time there's a negative shock to the economy, the household sector won't be the same source of stability. It might be the source of instability." On one occasion, he was so drunk, police were called to the intersection of Carrington and Huatoki streets at 7.30am by concerned members of the public who had reported a man asleep in his car. Police arrived to find Brunning asleep in the driver's seat with his keys in the ignition. (The judge's) decision followed an appeal by defence counsel Turitea Bolstad for a fine to be imposed, so Brunning could go with his mother to live in Australia. Brunning's family embraced with cheers of congratulations after he left the court. So now the government is considering bailing out the Overlander. 51 percent of poll respondents to Stuff say they wouldn't use the service to keep it going. That should be good enough for a Minister spending somebody else's money. The Overlander was constantly unreliable. Not a proposition that any self-respecting tourist agent would want to promote. And unfortunately that's where the service's viable market lies. Does she know anything about the life span of dogs? The Children's Commissioner organised another meeting yesterday to discuss youth crime. Same old, same old. Our current approach is fundamentally sound (despite it not actually working) and potential criminals almost always come from a "high risk" group who are easy to identify. So, why not identify them? Nine times out of ten they will be registered at WINZ within days. There's the first flag. If we are going to pay people to hold onto babies they can't raise well or even adequately, at least use the system to some advantage. Lesley Max, chief executive of the youth lobby group Great Potentials, agreed with Judge Becroft. She said a major factor in early intervention was parenting, and funding was needed so more help could be given to teach good parenting skills. The steps to stop children becoming the victims of abuse were the same as the steps to stop them becoming perpetrators of crime. New Zealand had a shameful record of child abuse, she said. A baby crying around a young male could spark a crime with fatal repercussions. International research indicates that most babies are killed before they reach 12 months and most newborns are killed by their mothers. But let's not mention that. And see what else she said? MORE funding is needed. We pay the wrong people to become parents and then have to pay more to teach them how to become half-decent parents? Oh, save me. Adrift in a ship of fools. Rates Probe? - The Prime Minister says it may be time for MPs to hold an inquiry into local government rates. Isn't that the most cynical move? Of course the PM wants to shut down Rodney Hide's bill so is giving NZ First the nod. Why? Because it's central government's aim to shove as much onto local government as it can over the next few years. They call it devolution. I'd call it passing the buck big time except.....they will hold on to the taxpayer's buck while the council takes ever more of the ratepayer's. The Children's Commissioner Laurie O'Reilly, who is terminally ill, has made his last planned public appearance at the Family Violence Symposium in Palmerston North. He used the occasion to urge more support for the Commission's Fathers Who Care: Partners in parenting programme. O'Reilly: " The most urgent thing now facing NZ is the issue of fatherless families we have to address and develop a new attitude to parenting, it is a shared responsibility. We have been so liberal and brave and modern in meeting our own needs as adults that we have overlooked our children and everyone has an obligation to see that changed..."
He would be disappointed in our complete lack of action and progress in the following years. Just more huis and programmes and worsening statistics. Pay for fatherless families and that's what you get. Miss Britt, 35 and the mother of three, entered the District's welfare system in 2002 after leaving an abusive relationship. She has finished classes in medical administration at the So Others Might Eat's Center for Employment Training and expects to be employed soon and off welfare within the year. Miss Britt never experienced the "unlimited" welfare of the old system, but says she doesn't mind that the Temporary Assistance for Needy Families (TANF) benefits are limited. "Temporary is just that," she said. "I know that it's going to end." She is grateful for the many efforts aimed at helping her leave welfare and get a good job. "Nothing is more gratifying than to walk into a grocery story with my own money, rather than a TANF card," she said. This is a stomach-turning story but the circumstances in which the alleged abuse took place aren't uncommon. What caught my attention was the headline, "Mother's lover denies abuse". I am looking forward to the day when I read, "Mother's love denies abuse." 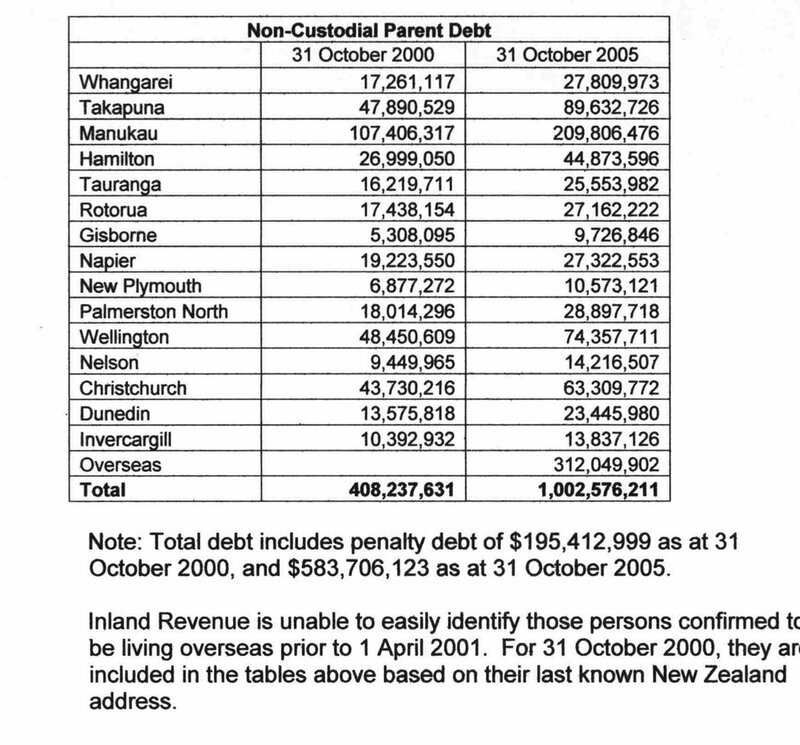 Total child support debt at October 31, 2005 was over $1 billion. The amount of debt belonging to non-custodial parents living in Australia is actually down slightly (6.4%) from $301,182,023 at October 31, 2005. Comparing sets of figures at points in time sometimes disguises a downward trend. That's not Judith Collin's problem but, if he is planning to make one, Revenue Minister, Peter Dunne is a bit slow. Probably busy swotting up his Oxford. 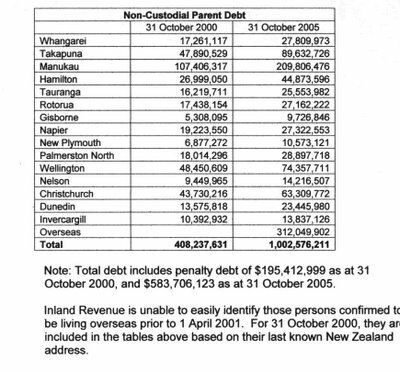 According to Judith Collins, In 2003, $73,207,549 was owed by liable parents known to be living in Australia. Today that figure has ballooned to $281,913,850. To put that into context, in 2004 the total collections for Child Support were $294,966,857! The huge Australian figures are in part the result of interest accruing. Any amount not paid by the due date has 10 percent interest added and a further 2 percent of the total amount is added each month. I know some readers are better informed on the subject of child support than I am and would be interested to know how much of the increase Collin's is reporting is due to more renegers fleeing to Oz and how much to accrual interest and penalties on existing debt. Andrei wondered what point I was trying to make by posting a Spectator letter about heroin and New York. None in particular. Occasionally I read something which makes me stop and think and figure it might make other people do the same. 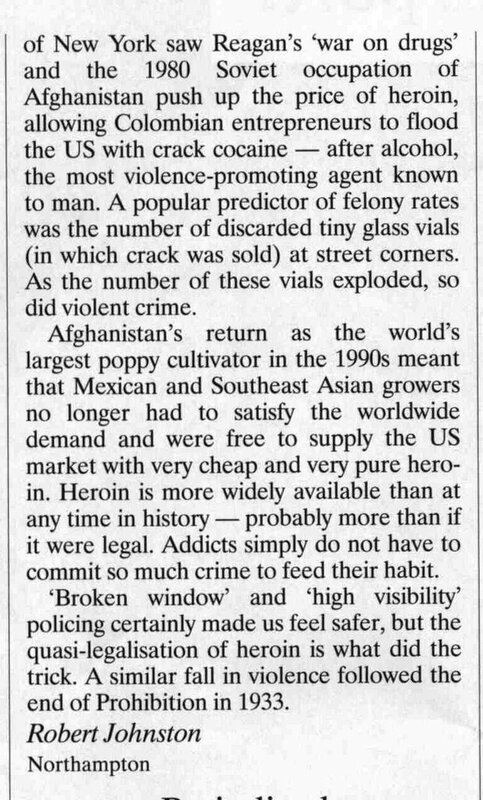 The 'crack epidemic' did contribute to US crime across many cities. But New York City's approach to crime has been especially successful where others have failed. That can't be denied. Crime is associated with many factors; relative poverty, race, family breakdown, welfare dependence, unemployment, drugs - their use and status, alcohol abuse, illiteracy, mental health problems, feminism etc. A claim that the resolution of any one factor has led to its reduction is extremely difficult to prove. Not long ago, the United States was declaring "mission accomplished" on crime: Homicide rates were plunging, the crack epidemic was over, the broken windows were fixed. Now, preliminary FBI statistics show that homicides rose nearly 5 percent in 2005, and news from around the country suggests that 2006 is looking worse. Our many Iraqs at home are making it clear that the self-congratulation was premature. 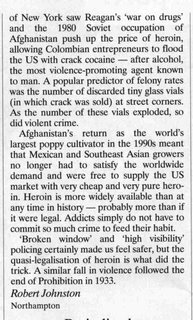 In reality, Americans were lulled into complacency about violent crime. And two new factors have emerged: Some of the law enforcement tactics used to fight crime in recent years damaged the social fabric in many communities and contributed to increased crime. More important has been the spread of a virulent thug ethos -- an obsession with "respect" that has made killing a legitimate response to the most minor snubs and slights. In parts of the District's Anacostia neighborhood today, a young man knows that the wrong kind of eye contact with the wrong person -- a "hard look" -- can cost him his life. Having watched every episode of this series there is something whiffy about NZ Idol. This is a talent show, surely. But each week the producers delve into the lives of each contestant looking for pathos - the more tragedy they can find the better. If the warbler isn't singing for a recently dearly-beloved-departed then they are singing for a recently dearly-beloved-arrived. Hell, is nobody allowed to sing for themselves? Of course, contestants have seen how surprise-selection Ashley cruised in on the public vote after revealing her endeavours were soully for her best-mate-recently-departed. Now they are all looking for some tear-jerker tale to get the soppys pressing buttons. Oh well. I pressed buttons for two based on the fact that they had decent voices. Matt, a brave Bee Gee be-alike sang To Love Somebody with passable earnestness and musicality (singing for his baby son). And Aroha, singing I'll Be There described as a Mariah Carey song, whereas comparisons to the adolescent Michael Jackson would have been more apt. She's like a Maori version of Bambi (singing for her koro after two years of silence since his passing). Got your hankies out yet? In the 12 months to July, Starship - New Zealand's largest paediatric hospital - admitted 48 children who were victims of "suspected or definite" child abuse. Most cases involved children under a year old. Seven of those children did not survive, a figure Starship said was unusually high compared with previous years. Overall, this equated to almost one hospital admission a week - with many of the cases "as horrific as the Kahuis", said Patrick Kelly, clinical director of the hospital's child abuse team. The writer refers to the Kahui abuse as "just the tip of the iceberg" but it could just as easily be the 48 cases are the tip of the iceberg. For instance, how many admissions occur at other hospitals?